"I love Chang's, its a great place to take friends and family for dinner or lunch. It's a great value and I love the variety." "Always clean and always delicious!! Attentive and friendly staff. Lots of parking and easy to get to. This Chang's is by far my fave!!" - Review from Brian C.
"Oh goodness, I love this place. It could have something to do with me being a good cook, so I combine the perfect ingredients and mix my sauce up like a pro." - Review from Bree C.
"Always helpful and nice staff, the food is always cooked to perfection! I love it!!!! My husband always asks to go, I think it's because he likes that they have shrimp, salmon and lamb." 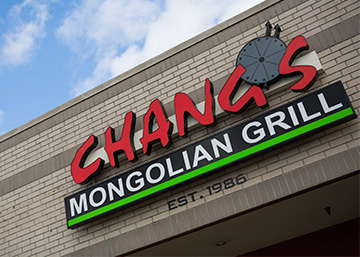 - Review from Millie G.
"I really enjoy Chang's Mongolian Grill... The selection that they have is wide enough to have pretty much anything you want, and to change things up regularly if you like to." - Review from Michael B.